The first telegraph system in Newfoundland was established as part and parcel of a scheme to land a trans-atlantic telegraph cable in Newfoundland. The 1851 legislation chartering the initial company established by F.N. 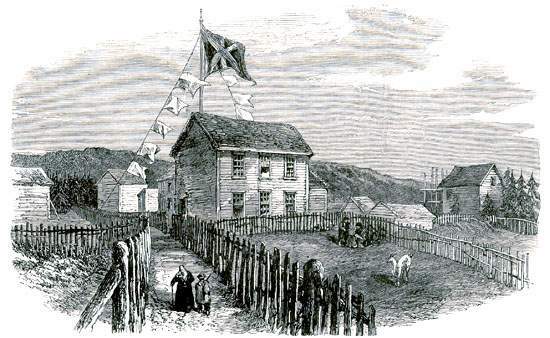 Gisborne provided for telegraph lines between St. John's and Trepassey, and St. John's and Carbonear - the latter became operational in March 1852. In 1854 the New York, Newfoundland and London Telegraph Company was granted a 50-year monopoly on telegraphy in Newfoundland, subsequently assumed by the Anglo-American Telegraph Company (AAT). The "Anglo" contract, however, allowed the colonial government to provide telegraph connections on the island in areas that the company did not think would be profitable - which in practice meant everywhere except the Avalon Peninsula. By 1867 AAT had lines connecting St. John's, Carbonear, Trepassey (with two branches connecting with lighthouses at Cape Spear and Cape Race), Heart's Content, Old Perlican and Placentia. In July 1865 a cable was successfully laid between Valentia, Ireland and Heart's Content. Drawing by Robert Dudley. From Charles de Volpi, Newfoundland: a Pictorial Record (Sherbrooke, Quebec: Longman Canada Limited, ©1972) 108. Under the original telegraph contract the government had the right to pre-empt the monopoly after 20 years, but this option was rejected in 1874. In 1876 the government announced its intention to extend the service to areas not served by the company. The government system was constructed by AAT under contract, and placed under the supervision of Alexander M. Mackay, Anglo's local superintendent. In 1877 a line was constructed from Avondale to Trinity, Catalina and Bonavista, and in 1878 a line was run from LaPoile to St. George's, Humbermouth and Tilt Cove. There matters stood until 1885 when the Thorburn government commissioned two new lines: from Shoal Harbour (Trinity Bay) to Gambo and Greenspond, and from Long Harbour (Fortune Bay) to Bay L'Argent, Burin and Fortune. In 1887 a line was laid from Mint Brook (Gambo) to Fogo, Change Islands and Twillingate. In 1892 Colonial Secretary Robert Bond headed an inquiry into the public system, and found that accounts were hopelessly intertwined with those of AAT, and even with Mackay's personal account. By this time, however, further plans for a public telegraph had also become enmeshed with the plan to complete the railway across the island, since the construction and operation of a railway relied heavily on telegraph connections. When construction resumed west of Whitbourne in 1890, the road initially parallelled the public lines to the Bonavista Peninsula and Fogo. A new construction and operating contract signed with R.G. Reid in 1893 provided for the contractor to construct a telegraph along the "whole line of the railway" (i.e. from Whitbourne to Port aux Basques), to become part of the government system. As the railway telegraph was extended, local lines on the northern and western coasts were connected to the railway telegraph rather than the Anglo system. A contract signed with R.G. Reid in 1893 provided for the contractor to construct a telegraph from Whitbourne to Port aux Basques. Courtesy of Archives and Special Collections (Coll-137, 10.12.002), St. John's, NL. 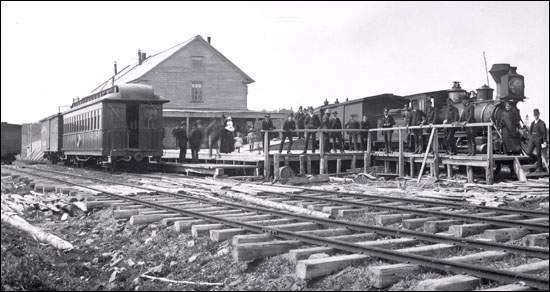 When a new operating contract for the railway was signed on completion in 1898, one of its controversial provisions was an option for Reid to purchase the whole of the government system for $125,000 and operate it for 50 years with a subsidy of $10,000 annually until 1904 (the expiration of the Anglo monopoly) and without subsidy thereafter. After a public outcry, a new government led by Bond initiated a new contract. Reid agreed to return the telegraph for an amount to be determined by arbitration. To Bond's fury, Reid filed a claim for more than $3 million - and was eventually awarded $1.5 million in 1905. Bond's policy of a comprehensive government telegraph system included construction of a new cable pole line along the railway from Port aux Basques to Whitbourne, which was extended to St. John's on expiry of the monopoly in 1904. A government cable was also laid across Cabot Strait, while a new Department of Posts and Telegraphs was established to consolidate the post, telegraphs and the incipient telephone system. Under the 1949 Terms of Union, the government telegraph and telephone operations (the later largely in remote areas) were transferred to Canadian National Railways, to be operated by Canadian National Telecommunications (CNT), which eventually purchased the operations of Western Union in Newfoundland, as well as some private telephone exchanges in central and western Newfoundland. In 1979, the telegraph business having been replaced by new technologies, CNR established Terra Nova Tel to take over its assets in Newfoundland. In 1988 Terra Nova Tel was purchased by Newfoundland Telephone.